For over 30 years, ICA has organized and hosted a Hindi School for both children and adults as part of Saskatchewan Heritage Organization of Languages (SOHL) programming and the Multilingual Association of Regina (MLAR). Balfour Collegiate has been the venue for many years for our program, along with those offered by Regina’s many other cultural groups. Hindi School is open to anyone interested in learning the Hindi language. Over the years, nearly 1000 students have spent time in that classroom developing their skills and appreciation of Hindi. Teachers for our Hindi School have some teaching background. They receive a modest honorarium for their efforts. We also have teaching assistants (mostly high school students) who come to help with the class. 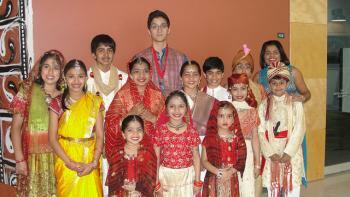 Beyond the classroom, students are encouraged to participate in Indian cultural events and special occasions. Each year, Hindi School graduation includes a celebratory activity. For example, the 2008 graduates spent a day at the Saskatchewan Science Centre. The annual enrolment fee for the Hindi Language School is free for ICA members, and just $20 per student for non-members. For questions and to register, please contact the ICA President.